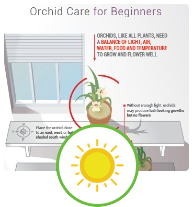 Generally temperatures between 50° and 80° F (10° to 27° C) are ideal for orchids; but occasional brief periods of temperatures above 100 F (38 C) or drops even into the 30s (0 C) will not harm most orchids as long as no frost forms on the leaves. Cold injury includes damage from temperatures above and below freezing. Chill injury is that which is caused by low temperatures above freezing, and freeze injury is damage from temperatures at or below freezing. Frost damage takes place when dew freezes after it has condensed on leaf surfaces if the air temperature drops below freezing. Necrotic spots on leaves and dry, brown pseudobulbs are symptoms of cold damage. 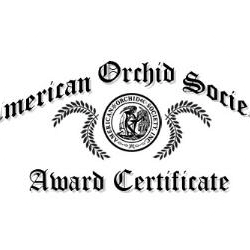 Consider cold hardiness when adding new orchids for your landscape or collection. 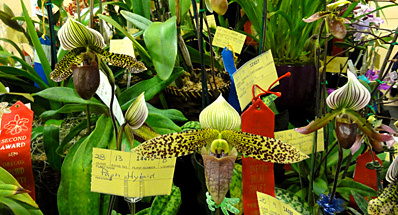 This is the measure of the orchid’s resistance or ability to adjust to cold stress. The degree of cold hardiness is determined by environmental conditions and the plant’s genetic makeup. Some species are always killed by colder temperatures, while others can tolerate short periods of temperatures near freezing. Cold injury symptoms usually become visible, not during the cold snap, but some days after exposure to critically low temperatures. The rate at which symptoms develop depends on the severity of the exposure and the conditions in the growing environment afterward. Continued cool temperatures and high humidity after exposure to cold may slow the development of symptoms, while high light intensity and warm temperatures may accelerate symptom development. ~ Surface lesions, pitting, large, sunken areas and discoloration. Water-soaking in tissues, usually followed by wilting and browning. ~ Accelerated rate of natural death. ~ Increased susceptibility to attack by fungi and bacteria. ~ Slowed growth, or limited growth flush. 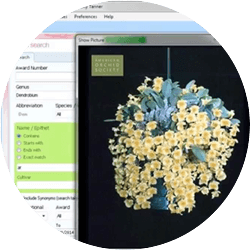 This may be difficult to detect without non-chilled plants for comparison or a thorough knowledge of the orchid’s normal growth rate. Orchids, even as landscape plants, can be pulled through a tough winter. The more trouble you take, the better your results are likely to be. Moving Plants Indoors: Container-grown outdoor plants can be moved to a warm garage or other indoor location for cold protection. If this is not an option, determine in advance which plants are most valuable to you. It is not a bad idea to mark those with a colored label, or keep them all in a particular spot. That way, if you do need to gather them quickly, you will not be searching through perhaps hundreds of plants and labels to find them. Like a phoenix arising from the ashes, Zeuxine strateumatica flowers from a pot on a bench of cold-damaged orchids. Also note, before winter arrives, which orchids in your collection hate cold. 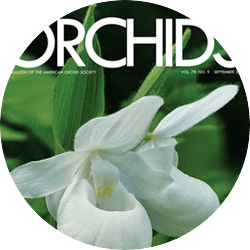 Many commonly grown orchids tolerate winter temperatures of about 55° F (13° C) at night, including some hardier Vandas, Stanhopeas, Oncidiums, Lycastes, Miltonias, Odontoglossums, Masdevallias, some Dendrobiums, Cattleyas, Catasetums and cool-growing Paphiopedilums. Most Cymbidiums can take winter night temperatures in the 40's (4° C), and many need such a stimulus to bloom well. White or yellow Vandas, as well as some Dendrobiums (Phalaenopsis and antelope-type), are especially sensitive and do not like temperature drops below 60° F (16° C); they can be particularly prone to losing leaves when exposed to cold temperatures. Cattleyas tend to be more hardy. Seedlings and immature plants, particularly those in flasks or compots, are usually much more sensitive to cold temperatures than their mature counterparts. 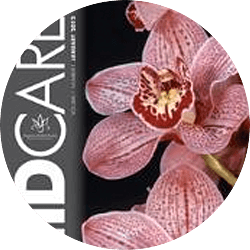 Items to keep on hand to quickly transport your orchids in an emergency include boxes, plastic flats or small crates and possibly a wagon or cart. Prepare the indoor space to be used as a temporary growing area for the arrival of the orchids. A garage, spare room or even a spare bath will work in a pinch. Ideal growing conditions are not the primary consideration; this is just a few days’ shelter until the cold passes. The area can be covered with plastic tablecloths, sheeting or tarp to protect floors and finishes. Heat, lighting and ventilation should be adequate; inexpensive supplementary heaters, lighting and a fan for air circulation can be purchased at local hardware suppliers as needed. Do not water plants the day before a cold night, as the less moisture in the plant’s cells, the better it will tolerate a freeze. Unless they are cold sensitive, or temperatures will drop too low, plants can be moved to the ground rather than indoors, or even covered and left in place. Sometimes more damage can be caused by moving plants frequently than if they are kept stationary. Have wraps, clothespins, plastic sheeting and twine ready in case of cold. Many materials can be used as insulating wraps. Frost cloth, available at most hardware stores, is lightweight and traps heat, but is designed to breathe as well. Sheets, blankets, towels, burlap and other coverings can also be used. Covering wraps in plastic that is kept from touching the plant by supports will provide an additional measure of protection from wind. 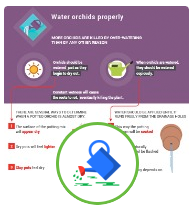 Avoid using plastic directly on the plants. When the sun and temperatures rise, plastic can trap too much heat and cook the plants. It is better used as a windbreak at night and opened or vented during the day. In addition to the insulating wraps and plastic covering, extra mulch at the base of bedding plants (reed-stem Epidendrums, Arandas, Mokaras, etc.) will help protect them from freezing temperatures. When the weather warms up, the extra mulch should be removed. The environment to which plants are subjected after cold stress affects the degree of injury and rate of symptom development. Importance of post-exposure environment varies with the severity of cold stress. Damage to plants exposed to extreme temperatures may be influenced by post-stress handling. Intense light, low humidity and high temperatures following chilling of some tropical plants result in increased water loss through transpiration. Extreme water stress can develop if the chill exposure has disrupted water absorption, temporarily or permanently. Cold injury to roots may not be evident until spring, when plants are stressed by higher temperatures. Failure to initiate a spring growth flush may be the only visual symptom of winter injury, and little can be done to minimize its effects by this time. Weakened or injured plants are more susceptible to disease attack, so growers should keep an eye out for symptoms and possibly use a preventive fungicide. Increased shade may also reduce heat or water stress during the recovery period. If the worst happens and your orchids are damaged by the cold, do not assume that they are dead. Allow the medium to dry, and keep the plants in a humid environment out of direct sun and high temperatures. Do not water until new growth sprouts. Watering may be resumed at this time, first with plain water, followed by a light dose of a fertilizer with a full compliment of minor elements as new roots develop. Ingram, Dewayne L., Thomas Yeager and Rita L. Hummel. 2001. 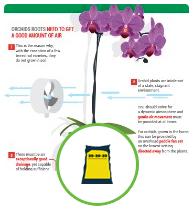 Cold Protection for Nursery Crops. University of Florida Cooperative Extension Service. Web article. Miss Kirby’s “Kommon” Sense Tips for Cold Protection. Sara’s Gardens Web article. 2000–2001. Quick Cold Protection. Better Lawns and Gardens Radio Show, Florida’s Radio Networks. Web article. Slump, Kenneth. 2001. Protecting orchids from cold. Orchids 70(8):753–757.